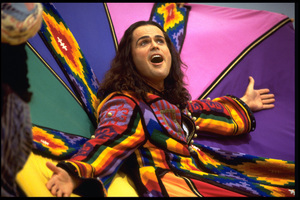 Posted on Thu, Mar 22, 2012 : 10:56 a.m.
Donny Osmond in "Joseph and the Amazing Technicolor Dreamcoat"
On Monday, March 26 at 8 p.m., and Wednesday, April 4 at 7 p.m., at Quality 16 (3686 Jackson Road) and Rave Cinemas (4100 Carpenter Road), movie theater audiences nationwide can sing along with Donny Osmond in Andrew Lloyd Webber and Tim Rice’s "Joseph and the Amazing Technicolor Dreamcoat." NCM Fathom and Omniverse Vision will present this fully staged, pre-recorded, never-before-seen sing-along production, which also features an introduction and question-and-answer session with Osmond live from Salt Lake City. Originally written in 1968 as a 25-minute "pop cantata," "Joseph and the Amazing Technicolor Dreamcoat" was the first staged collaboration between Webber and Rice. Since the first professional productions began in the 1970s, "Joseph" has become one of the most popular musicals in the world—more than 20,000 groups have presented it in North America, with nearly 1,000 new productions every year around the world. "Joseph" follows the biblical story of Jacob and his 12 sons. Sold into slavery by his jealous brothers, Joseph finds favour with the Egyptian noble Potiphar, but finds himself thrown in jail after rejecting the amorous advances of Potiphar’s wife. But Joseph discovers his special powers to interpret dreams, and soon finds himself in front of the mighty but troubled Pharaoh. With his bad dreams interpreted, a grateful Pharaoh rewards Joseph handsomely, making him a rich and powerful man. Joseph’s brothers journey to Egypt to escape the famine in Canaan, and seek an audience with this “stranger.” After begging for his forgiveness for their previous dark deeds, there is a joyful reunion between Joseph and his brothers. The pre-recorded version of "Joseph" is based upon the worldwide smash hit production that originally opened at the world famous London Palladium in 1991 and went on to tour globally, grossing over $300 million. Shot at London’s Pinewood Studios at the height of the theatrical run in 1999, it features Osmond as Joseph, a role he played in more than 2,000 shows across the U.S. and Canada. Osmond is supported by West End diva Maria Friedman as the Narrator, Joan Collins as Mrs. Potiphar, and Sir Richard Attenborough as Jacob. It won the prestigious Silver Rose of Montreux in the Best Music Programming category. Tickets for this Fathom "Joseph" event are available at participating theater box offices and online at www.FathomEvents.com. Fri, Mar 23, 2012 : 10:16 a.m. I am not sure where i got this from or who, but PBS also had this with Donny Osmond as well. We still have the video and love watching it just to have some fun with. If you have not seen it? Go. This is well worth the watch and if you find the video? Own it for some times with the children or along with popcorn.